It is always nice when we host a blog tour or author stop. As book readers, we appreciate and support authors and today marks a very special day for one writer. 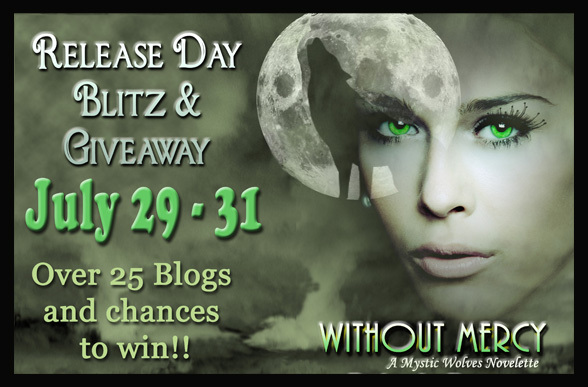 The Without Mercy Release Day Blitz and Giveaway begins today and runs through midnight on July 31. You may have noticed we sponsor a lot of Bookish Snob Promotions tours and now The Bookish Snob herself, a prolific blogger, book promoter, and lovely person, joins the ranks of published author. Congratulations Bels! Over 25 blogs are showing their support for this tour and each blog is giving away TWO copies of Without Mercy. That's a lot of chances to win this new paranormal novella. To win one of two copies of Without Mercy, leave a comment below and don't forget to check out the other blogs. Good luck. "Without Mercy" looks great. Loved the blurb. Oooo, this looks good! I do love a great paranormal story! Without Mercy sounds great. Thanks for the Giveaway! Sounds great! Thanks for the chance! !